On our way home riding a jeepney one afternoon when I was in Grade Four, a bunch of people handed out to us and our fellow passengers free copies of The Manila Times. That was in mid-1999, and though I no longer recall where the distribution of these papers happened, I will not forget its main story: “Nasagasaan kami ng jeep ni Erap.” The piece goes with a cropped photo of the then President driving a jeep. Because of the pro-Estrada sentiments in our family at that time, and because I am merely 9 then, I didn’t give much attention to it. I didn’t even set aside that give-away for posterity’s sake! I was only able to realize the importance of that moment many years later, when I was already a journalism student in UP Diliman. I learn the true story behind the paper being “ran over.” Estrada filed a Php 99 million libel case against the paper, and facing the prospect of a prolonged legal tussle against the country’s most powerful man, the paper folded up, and then changed owners. One of the key figures in that event was the late Lourdes “Chit” Estella-Simbulan, Manila Times’ then-managing editor. As I took my first journalism class in mid-2007 (History of the Press, under Ms Evelyn Katigbak), I learned about that classic episode in Philippine media’s history. Over a year later, I’d be enrolled in one of her classes. As a final requirement for that subject titled “The Newsroom,” students must produce a newspaper by the end of the semester. The class had its line-up of news executives, and I was the paper’s associate editor, or second-in-command. For reasons that already escapes me now, we named the paper “The Signum,” a name Prof. Simbulan later described as “innovative, creative, (and) interesting, though a bit strange.” All did not go smoothly, though. That was a vindication for the efforts our entire class exerted for that output. I would’ve wanted to take other classes under her, but she went on study leave on my senior year. I remember gleefully answering a two-page “test” about Philippine history as part of her graduate studies research late 2009. Nevertheless, we still got to exchange pleasantries whenever I see her around the campus, or during her lunch meals with my thesis adviser Prof. Yvonne Chua. 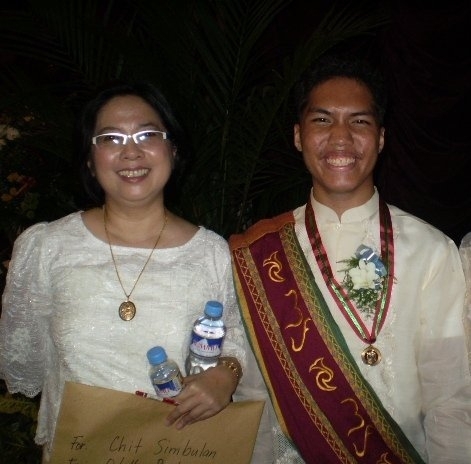 I once kidded her (outside the UP College of Mass Communication building) that the only way she’d be my professor again is if I’d stay in UP beyond April 2010, my graduation date. She said she hopes that I’ve already graduated by then, and humorously quipped, “and with a job!” She emceed that year’s college graduation rites, and right after the ceremonies, I went up the platform of the UP Film Center to … have a photo with her. She gladly obliged, and now that she’s gone, that picture became all the more priceless to me. I asked if she has a Facebook account. She said yes, but I was never able to search it. Months later, we saw each other again in the college. I came to ask for a recommendation from Prof. Chua about my application for MA History last August 2010. After greeting her, she ribbed me: “Mr. Madrona, I thought you already graduated!” Of all my journalism professors, she’s the only one to call me that way. It is saddening to note though that that encounter was the last time I saw her alive. I called Prime Funeral the morning after Professor Simbulan’s death, but I was told by a personnel there via phone that her remains had been transferred to Arlington Memorial in Araneta Avenue. I went straight there after work (I rendered overtime service for my company that day). I initially thought that Arlington is just walking distance from the Araneta Ave.-Quezon Ave. intersection. I was mistaken since another jeepney ride is needed. Once I am finally inside the memorial chapel. I immediately approached Mr. Roland Simbulan, whose face is recognizable to me having attended some of his talks before. He’s accommodating even to those he did not know personally. The former UP faculty regent and foreign policy commentator understandably refuses to speak to the media. I proceeded to take a look at my departed journalism professor. She’s wearing a Filipiniana, similar to the one she wore during last year’s graduation rites. I saw CMC dean Dr. Rolando Tolentino (he surprisingly still recognized me), college secretary Dnilo Arao, journalism department chair Marichu Lambino, and Professors Luz Rimban and Lucia Tangi. I also saw former dean Dr. Georgina Encanto’s name in the guestbook. I stayed for about 40 minutes. On my way out of Arlington’s Felicidad chapel, I approached Mr. Roland Simbulan to say how proud I am to have been once under his wife’s mentorship. The appreciative widower told me: “Chit lives on through students like you.” The important lessons in journalism integrity and professionalism that she emphasized to us will be her biggest legacy, but Mam Chit is irreplaceable. This entry was posted on Monday, May 16th, 2011 at 10:41 am	and tagged with Arlington memorial – felicidad chapel, chit estella, Chit estella death, Chit estella simbulan death, chit simbulan death, lourdes simbulan, Roland simbulan, tribute and posted in death, journalism, personal matters. You can follow any responses to this entry through the RSS 2.0 feed. just a minor correction. the word should be “widower”, not widow. Good morning! Thanks for pointing that out. I appreciate your time.